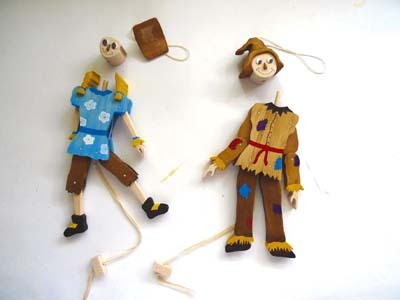 The Jumping Jack - or should we say, Jumping Scarecrow - toy is one of the oldest and simplest mechanical (moving) toys to make, originally a cross between a puppet and a paper doll. 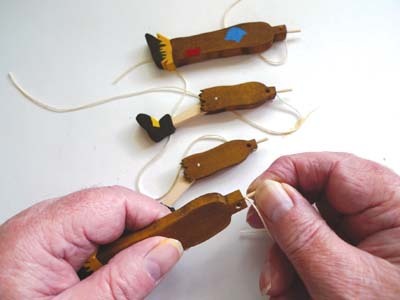 The simple action of pulling the string and seeing the arms and legs spring up never fails to amuse children and adults alike! First, make two copies of the pattern - one to use and the other to keep as a reference. 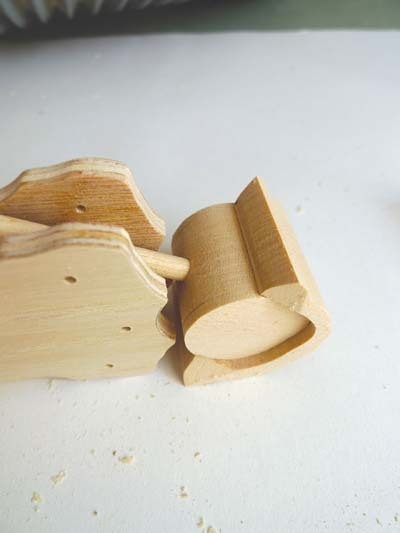 Referring to the cutting list, prepare the wood stacks for each piece. Secure each stack with masking tape and then adhere each pattern on top of the masking tape - the tape also makes removing the paper pattern a lot easier. 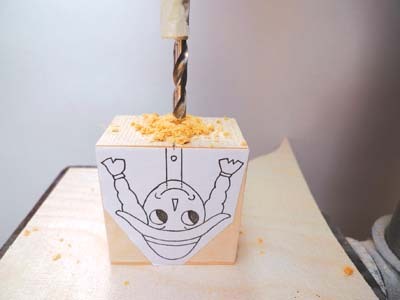 First, mark the position for the dowel support on the underside of the head/s, and fit the pillar drill with the 6mm drill bit. 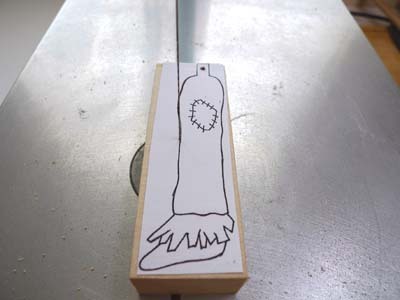 Check the required depth and then mark the drill bit with a piece of masking tape. 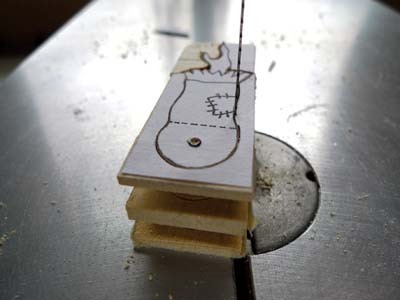 Drill down to the marked depth to take the support dowel for the head. 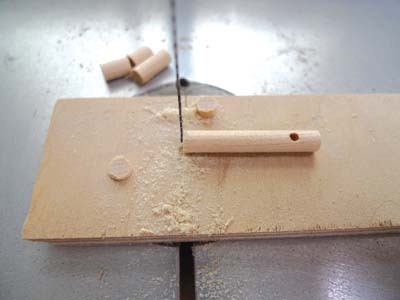 Change to a smaller 3mm drill bit, then using a scrap piece of wood to hold the 6mm dowel secure, drill the 3mm hole for the small 2mm dowel to pass through. 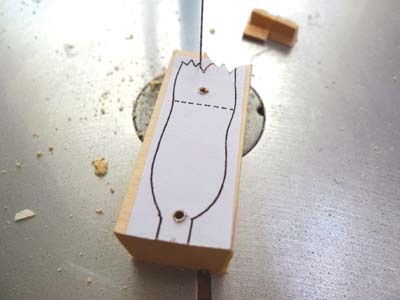 Still using the 3mm bit, drill all the inner holes where you want the limbs to swing freely, then change to the 2mm bit to drill the outer holes that connect the arms and legs to the body. 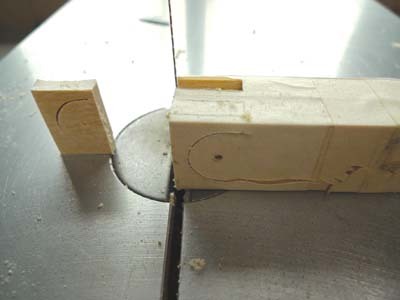 Fit the scrollsaw with a No.5 blade and as usual, check that the blade is at 90° to the table. 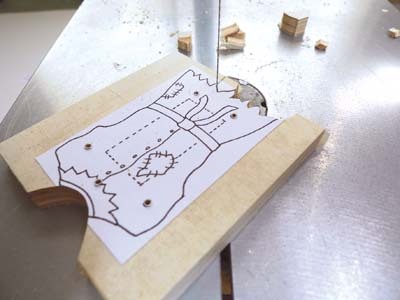 Where possible, try to make one continuous cut around the pattern to remove the pieces. 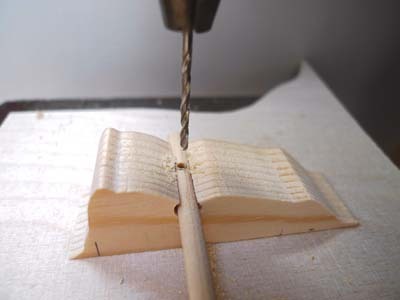 In some cases it is easier to cut into the zigzag end first and then continue with the cut. 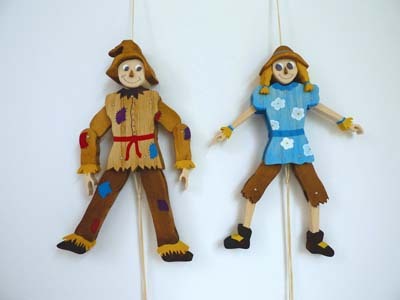 Slots need to be cut in both the knee joints of Mr Scarecrow and in the elbows of Mrs Scarecrow, to be able to take the adjoining limb (see pattern). Mark the slots for the elbow joint onto one side of the lower arm of Mr Scarecrow, then first cut part of the pattern around that section, and secure the cut piece with more masking tape to keep the stack secure. 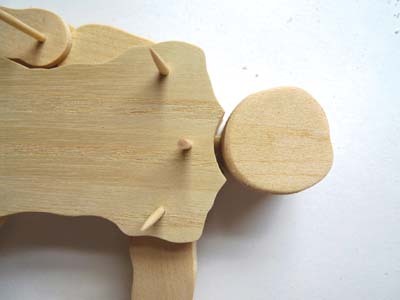 Turn the lower arm piece onto its side to cut out the slots and remove the waste. 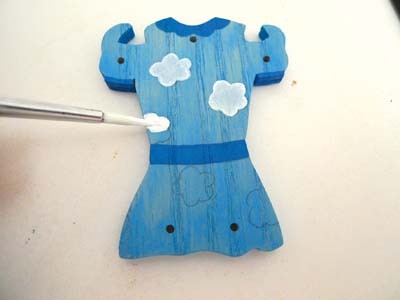 Turn the piece back over so the pattern is uppermost and continue to cut out the remainder of the pattern. Carry on cutting out all the pieces, remembering to cut away the top and lower sections of the bodies before cutting the sides, so the stack stays intact until the very last moment. 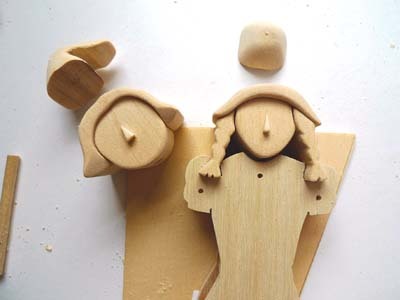 Lastly, cut out the heads. 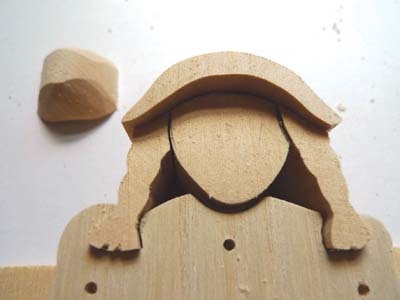 At this stage you can either leave the heads whole and just sand around the edges as one piece, or do as we have here and separate the hat and hair from the face, so that they can be shaped and sanded individually. 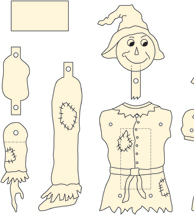 Mr Scarecrowâ€™s upper arms need to be tapered down so they can slot into the lower arm at the elbow. 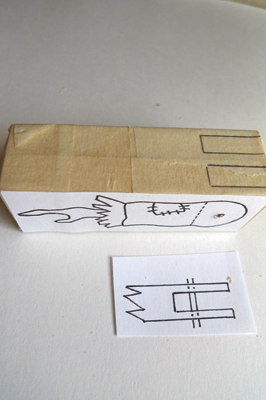 Use a pencil to mark the width. 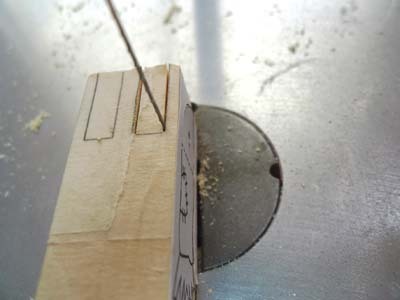 Either sand or cut a wedge shape, and then place a cocktail stick through the adjoining holes to test that the joint moves freely. 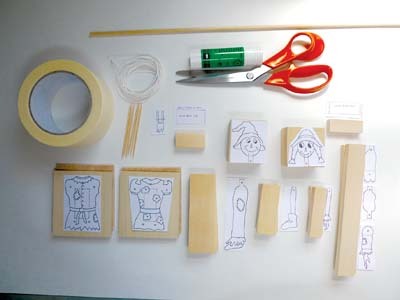 Use the same process for Mrs Scarecrow's knees. Hand sand all the pieces smooth and round over the edges. 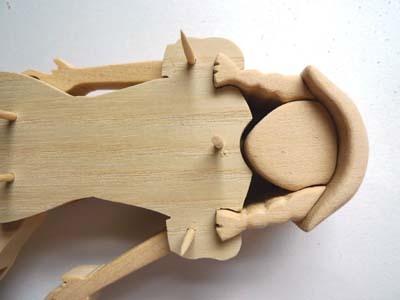 If you have cut out the heads into separate pieces, temporarily place the two pieces of Mr Scarecrow's body together, with the centre block in between. 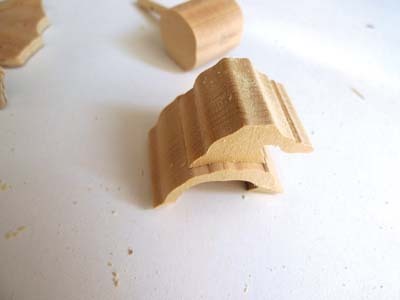 Then using a pencil, mark the position of both sides of the body onto the face - these will then be your guidelines so that you do not sand the face down too low, as you want the head to be just proud of the body. 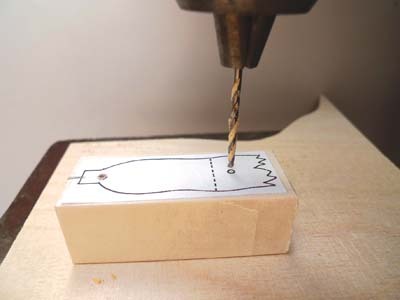 Shape the rim of the hat around the face, and then sand or cut the top of the hat thinner than the brim. 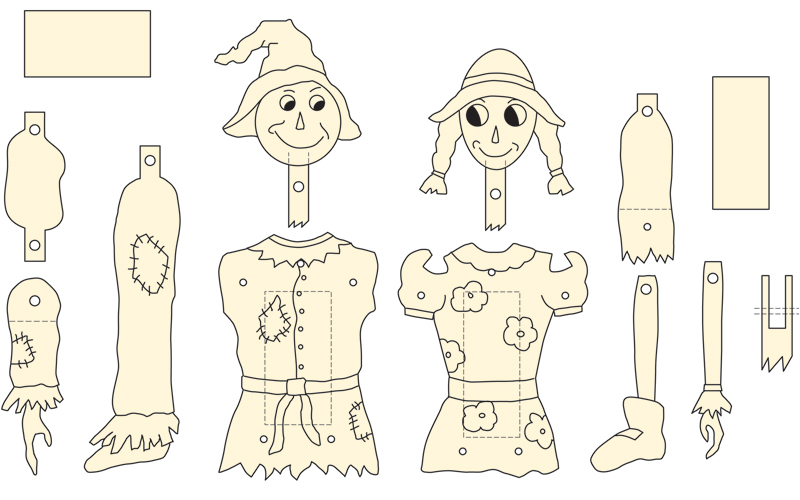 Use the same principle for Mrs Scarecrow, making sure that her face and hair are just above her body. As before, hand sand the pieces smooth and cut some small triangles for noses and circles for the eyes (optional), as they can be painted on if wished. 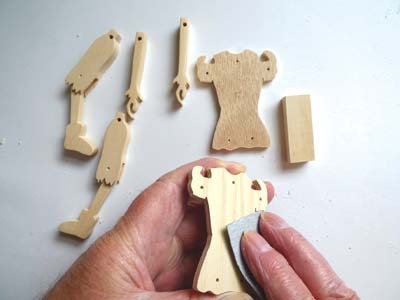 First, cut seven 2mm cocktail sticks in half (making fourteen), and assemble each body with the arms and legs, and the centre block in between. 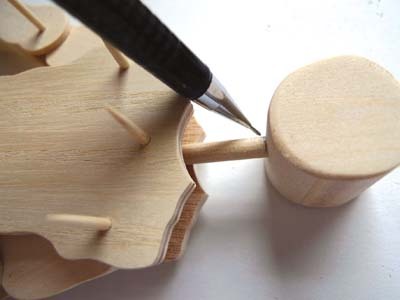 It's a fiddly job, but persevere and it will come good with patience. 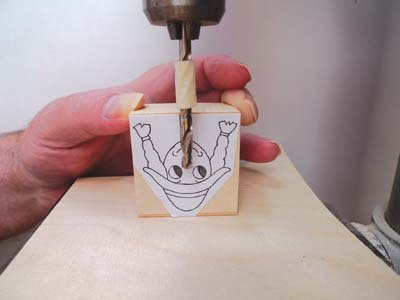 Next attach the 6mm head support dowel, push the scarecrowâ's head firmly down on the dowel, and mark the location. Work out roughly the amount needed to be removed, and then cut off on the scrollsaw. 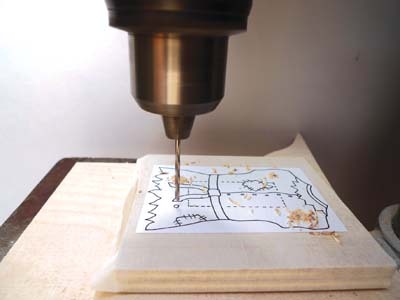 Thereâ€™s a sub-bed over the scrollsaw bed here to aid in the cutting of such fine waste material. 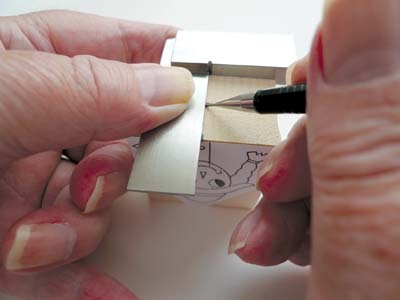 Cutting small bits at a time is always a good idea, so that you end up with a gap of 2-3mm. 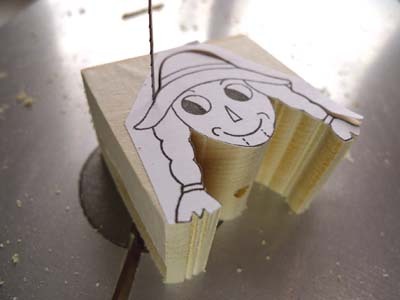 When adjusting the height of Mrs Scarecrow's head, remember to take into consideration that the ends of the hair sit inside the shoulders, and that the hair should also meet in the correct place on either side of the face. 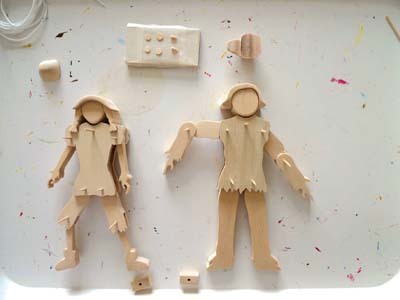 Have a final check before colouring that everything fits ok and that the limbs swing freely. We feel the choice of colours is a personal thing between you and the lucky recipient! It may be helpful though to draw on light pencil lines to identify, for example, where the bottom of trousers finish and the straw starts. 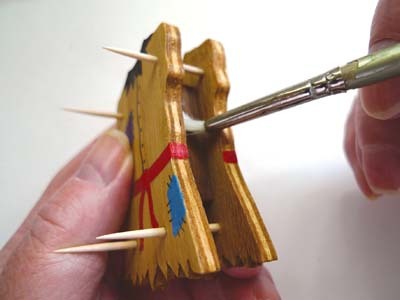 When painting the very small pieces i.e. the eyes and noses, tape a piece of masking tape - sticky side up - to a small piece of ply, and place the eyes and noses onto it. This makes painting a lot easier. Once the base colours have dried, you can paint on the belts, flowers and patches. 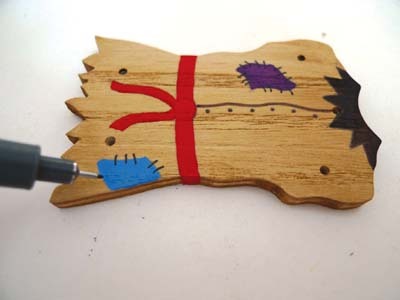 If painting on the accessories seems a bit daunting, try using felt pens. We used a fine-tipped pen to add the stitching around the patches. 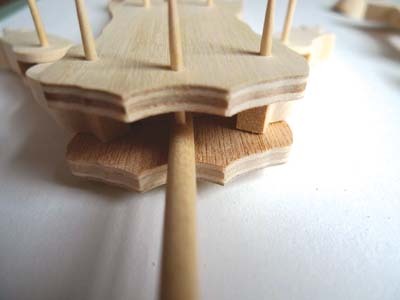 First, glue the centre block in position between the two body pieces and then align the body using spare cocktail sticks. 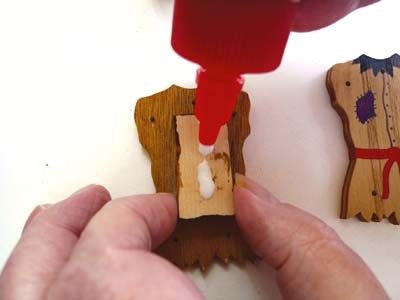 Wipe away any glue that may have oozed out and then put to one side to dry. 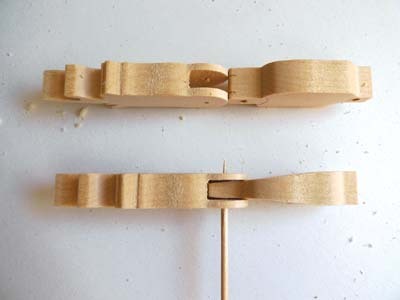 Next, cut eight lengths of cord to approximately 300mm and then attach the cord to the tops of the arms and legs by first making a small hole with a bradawl. Place the end of the cord into the hole, along with the ends of cocktail sticks dabbed with glue, and leave to dry. Cut two more 150mm lengths of cord and attach both ends into the top of the hats in the same way. 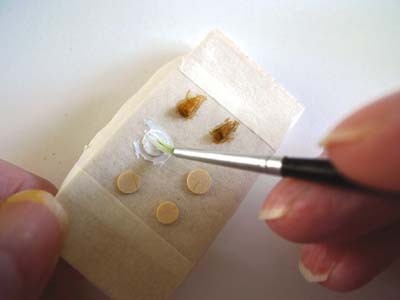 Mark and cut all the 2mm cocktail sticks to the correct length and then attach the arms and legs to the bodies. Bring all the cord lengths together at the bottom of the body and then make sure that the arms and legs are in the straight down position. Next, tie a knot a little way down from the body. Cut the cords to all the same length, and then slide on the small pulling block and secure by tying another knot at the bottom.